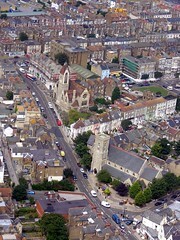 One view of Cliftonville but I've also been busy taking photos of Birchington, Westgate, Margate and Broadstairs too. Hartsdown school is in there for the first time I think as well as more detailed shots of King Ethelbert's school in Westgate and the Ursuline College. Lovely pics, Dr Moores. Is that the Ursuline College Sports hall going in within a few feet of the houses at Ursuline Drive? I bet they wished they had not opposed Ethelbert's plans now ! I guess it must be! Pleas check out the only inland green space - top right - in Dalby Square. I also would like to express my appreciation to Dr,Moores for going to the trouble of processing these aerial photographs so that we may all enjoy them on the www. Thank you. Lovely photos but what happened to Ramsgate,,,or like a lot of other people do you think the world ends at Dumpton? Very difficult to get in there..Dumpton etc .. as it's in the Manston ATZ. Only available on Xmas day and before and after the airport is closed!